A functioning HVAC unit makes for a satisfied homeowner. Repairs to your heating and cooling system can be a significant expenditure. Learning how to do your own preventative care can increase the efficiency of your units. Here are simple HVAC care guidelines that can extend the life of your system. Hearing a rattling sound coming from your HVAC system can mean a few things. Chances are you have some kind of debris in the system (such as a twig) if it originates from the outdoor unit. Turn your system off and cut power to the AC, and then remove the debris. If there is no debris, check to see if the rattling is coming from a furnace or other internal component. Call your HVAC technician if the rattling seems to be internal. If so, removing the blockage won’t be as simple. Banging can be the result of a broken piston pin, connecting rod, or crankshaft in the AC compressor. Your indoor blower may also be uneven. A banging sound may also show that your system needs a compressor replacement. Clanking is another symptom of a loose or out-of-balance part. 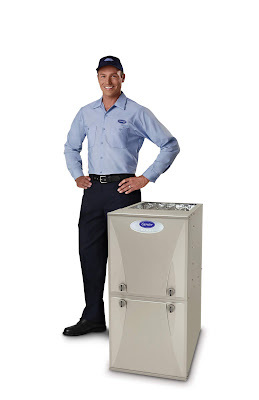 Cleaning and replacing your furnace filters are essential upkeep tasks. Doing so on a regular basis will guarantee the effectiveness of both your air conditioner and furnace. You'll find the filters along the length of the return duct on central air conditioners. For other types of AC units, filters can be in ceilings, walls, furnaces, or on the air conditioner itself. If you don’t change the filters often enough, pollutants can permeate your HVAC system. Using the incorrect filters can also block the movement of clean air due to dust obstruction. This leads to your system having to work harder to distribute air. It can also affect the respiratory health of your family. 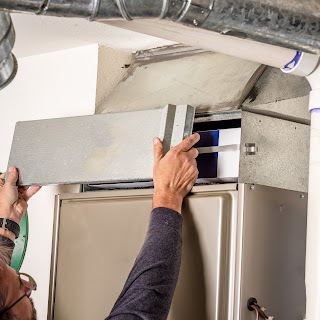 Contrary to what many people believe, the primary purpose of a furnace filter is not to clean your air but to prevent dust and debris from getting into the blower fan. That being said, it will help the quality of indoor air by removing such contaminants from being recirculated. We suggest keeping tabs on a monthly basis as dirty filters can drastically reduce your systems ability to work at optimal performance. Typically, furnace filters should be replaced every 3 months or sooner if you notice it is dirty. It is also encouraged to opt for an Energy Star certified furnace model - should you be looking to purchase a new furnace - as certain models can reduce heating costs by 30 percent. Keep your outdoor AC equipment clean and free from all organic debris. You'll have better airflow, and your system will do better and last longer. Make sure that there is a border of at least two feet between your outdoor unit and any shrubbery in your garden. Make sure you cut the grass around your air conditioner. Blow grass clippings away from the equipment or mulch them into the ground. Clear away any twigs or other items touching your air conditioner. Make sure nothing is obstructing the area. During the fall you must make sure and remove all leaves away from the appliance. Clean your HVAC unit every few months. Don't wait until spring to do it. Material that has been gathering in the unit all year long can get trapped in the HVAC interior. That will make it hard to clean. A winter cover for your outdoor unit may be necessary, however, covering the entire unit may result in trapped moisture. If debris getting inside the housing is of concern, short covers are recommended. Blocking air vents with curtains or furniture can limit air circulation. Ensure that your air conditioner/ furnace vents are clear (unless, of course, you spend a lot of time huddled under your sofa). Your HVAC system must have enough airflow to work well. Obstructed or closed air vents can hinder airflow. These obstructions cause ineffective operation or freezing. Schedule maintenance, typically at the start of the fall and/or spring season to ensure your system is ready for the more intense weather arriving in the winter and summer months. You may find yourself asking “why is it important to have regular maintenance on my home comfort system?” Well, you wouldn’t buy a brand-new car and expect to never have to put air in the tires, change the oil and check out any unusual noises, would you? In the same way that an automobile requires periodic maintenance for optimal performance, a home comfort system should be regularly inspected by a qualified technician. During a routine maintenance call, your system will be screened for possible problems to prevent them from becoming major repairs down the line. The technician will also do a thorough cleaning of parts that should require it, such as your coil to ensure the system is running at its top capability. The benefits of maintaining your units include energy and money savings. You'll also stay comfy throughout humid summers and dry winters. Air Makers and 1st Air will be pleased to assist you with all of your HVAC needs.